Welcome to the sixth, and last, excerpt from chapter 5 of my experimental surrealist sci-fi novel "The Iron Meditation". The book has not yet been published in English, but you can buy the Norwegian version from here, here and here. If you want to read an excerpt in Norwegian, you can look at this, this, this and this. I leave what seemed to be a never-ending hall, and my path narrows between rusty copies of well-known architectural buildings that no longer exist. The profusion of statues end, and are replaced by mere reliefs on the walls. Flakes of rust hang from the ceiling, and cracking sounds come from the floor. Like this, it keeps repeating itself for minutes, maybe a quarter, maybe more. Sometimes, what now seems to be a corridor turns so I no longer have a clear sense of direction. The drumbeats have stopped. And then I can detect a strange smell in the air. Smoke reaches me and seems to be coming from up front. The corridor widens again and I find myself in a room with high ceiling. In the middle of the room, there is some kind of goblet in silver color, standing on a square table. The smoke is coming from there, and the temperature in this room is hot. I can hear an angry, boiling sound. I approach, nonetheless, until something spills from the goblet. I take a few steps back. An information sign informs: Goblet made of tungsten, also known as wolfram. Tungsten melts at 3422 degrees celsius and boils at 5555 degrees. Because of its great ability to withstand high temperatures, it can contain boiling iron which only needs 2861 degrees before boiling. Iron is a stable element and much utilized metal. It can react with other elements and create various alloys. Oxygen causes iron to rust. If iron couldn't be made into many forms like this, this park wouldn't have been possible the way it is today. Every object is iron in some form. At 1538 degrees they will melt again, and become something new. I open the door. And close it again, in fear. In shock. Time stops. My breath shivers until I take it deep. My heart starts skipping beats. And then the tears come. The fear. The insecurity. And I look back at the smoking goblet. This was what I wanted, and yet: What will I say? How will I communicate? On the other side, you see, is a human lady. With white, unruly hair. That's all I had time to see. I scratch my pinky finger with the nail on my thumb. Rapidly. OK, I think to myself. I open the door again, enter, and let the door close behind me. Standing still, staring at the lady. Welcome to the fifth excerpt from "The Iron Meditation". 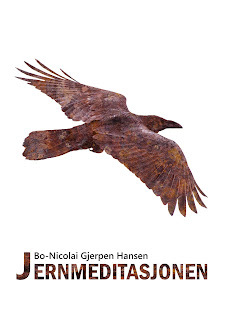 "The Iron Meditation" is my experimental surrealist sci-fi book, thus far only published in Norwegian. I decided to share my first draft for the English language version of chapter 5 on my blog. This will be the fifth of a total of six excerpts. I've taken some time thinking about this one and I've decided not to put out part 5 (of chapter 5) in its entirety since it contains some rather sexually explicit paragraphs. I also decided to turn that up in the English version which is not a direct translation of the Norwegian one. You can buy the Norwegian version here, here, here or from other sources. If you want to read excerpts from the Norwegian version of my book, you can take a look at this, this, this or this blog entry. And then it ends. As I look at them, they corrode. Within seconds their bodies turn rusty, exhanging an even metal shine for a nonreflecting dryness, like sand on a cloudy day. And to sand they turn, falling apart into red and brown powder, covering me in dust, disappearing, leaving me alone. And even colder than before. Was it even real? The hope of something vanished, but what happened to my thirst? I brush some dust away but it seems to gradually vanish by itself. I don't really know what happened, but at least I want to get moving again. How is it possible to make something like this? How can this park be the product of one human artist and how can it all be made of iron? Another information sign: Rust is iron paired with oxygen. Very well, I hope for water (H2O, that is, I'm certain). Welcome to the fourth excerpt from my sci-fi novel, "The Iron Meditation". What I'm putting out on my blog, is chapter 5, titled the same as the novel itself. While the novel is not published in English yet, you can publish the Norwegian version from here, here or here. I have also published excerpts in Norwegian: "Naturmeditasjon", "En drage av forurensning", "Det eneste mennesket i verden" and "Trommeslag". I notice how hard it is to walk - that the preceding office eternity didn't prepare me for even a park. As if I had magical abilities or there were a god listening in, an oldfashioned iron bench appears. I do as I'm tempted to, lying down on it to look at a sea with a boat on amidst flying fish beneath a bavang-dhang - that is a high-tech tool with robot properties. It's heart-shaped, anyway, so it's not for everyone, neither are the submarines peeking up from the ocean. And what about the ice berg, ice adrift, polar bears and clouds in the sky? And it's all made of iron. The bench slightly vibrating, shivering, floating in its coldness, or is it my skin? I'm still half naked as the world is moving and iron waves curl on the surfaces. No one is talking in the wind, I'm just observing. And I'm thinking about the drum. Will I ever actually see it, and can I play it? I'd want to be observant when the sound appears so that I can summon it within my mind and thereby co-create thus imagining myself playing the drum. But I find myself unable to visualize it properly. I am waiting for the drumbeat. I repeat the memory of the sound within my head. And I manage to synchronize the memory of the sound within with another actual drumbeat from without. And that is me playing the drum. And then I run. Passing rhinos, dragons, deers and giant octopuses, statues of famous people, villains, ghost army, straw people. And I'm out of breath. I gasp and feel as weak as those who did not consume weight supporting food. My brain is buzzing, and the taste of iron in my mouth mirror the world. I opt for the floor, lie down, scratching my knees in the process. I'll attempt to recollect myself. And something else is new: I am terribly thirsty. Drinking water would be the loveliest thing on earth. It's too far to the rusty water and it's probably not the healthiest to drink. So I hope for the future to present it to me. That I will find water or that someone will bring it to me. I have my back against the floor and the floor is cold. I want to dress back into the grey cloth I still carry around, but, it's wet and will feel uncomfortable to put on. Welcome to the third excerpt from my sci-fi novel, "The Iron Meditation". The excerpts here are taken from one of the most surrealistic chapters of the novel, loaded with symbolism. While the novel is not published in English yet, the Norwegian version can be bought from here, here or here. I've also published excerpts in Norwegian. You can read "Naturmeditasjon", "En drage av forurensning", "Det eneste mennesket i verden" and "Trommeslag". I see a giant flame in front of me arising from a flower made of metal. The hall in which it sits, is dimly lit by it, and the organic light from something I believe to be candles. They are like tiny sticks supporting tiny, tiny flames on top. So-called grey cast iron can appear to be pretty dark and is darker than iron in its pure form. Grey cast iron contains between 2.1 and 4 per cent carbon and 3 per cent silicon with traces of other elements. Iron has been, and remains, the most important metal, economically speaking, in the civilizations within the asteroid belt. Iron is heavy, but can be formed to anything allowed by imagination. Crows have cleaned my body dryly. In the quiet (relative freedom?) I think to myself: I am the only one here (it appears). Maybe I can stay here for a long time? Is there any haste? But what if I don't have much time? What if they come for me and take me back to my room? Are there more amazing things further inside the park or should I take my time to savour everything on my way? I return to the rusty water and lay down. I close my eyes and inhale the smell of metal. My legs and feet are invisible under the red-brown surface. When I beat my palms against the water surface, it makes cracking sounds. I repeat, and I do it over and over. This is my drum. And here comes my laughter. Hitting the surface is fun. I wonder what it would be like to swim? And then I imagine my head under water and I get scared. But what if I did? Can I trust the surface to be soft when I break through, or will it be as hard as the sound of my hands beating it? Nauseous, I get up and out. Maybe I can return here, maybe I can't. I did get something. I did check out the water although I didn't dare to try and swim in it. And now I'm walking down the hall and that's new too. As is the flower and the flame. I stop in front of it and I can smell the smoke, and feel how it creates melancholia, like from a memory trying to show itself from a time I can no longer remember. I never smelled smoke in my office prison. And beyond the flower there are amazing statues of blackened iron. There are horses here. Big horses and small foals. Swans are flying through the air but they are not alive. They are made of iron too, although they move lightly. I can not understand the mechanism allowing them to fly. There is no rope, no thread, no sound of machinery. Here are trees and I notice the intricate patterns on their leaves. Here are insects in the air, landing and taking off from leaves and branches. And here are iron books that I cannot read or turn the pages of. I can see spiders, cows and snakes. One snake in particular attracts my attention, because she is a giant. She carries a book between her fangs and I get the idea that she thinks of it as her own, that she protects it from the world outside, from the other snakes and from it all. But also this is just a thought, because she is made of iron, so is her book and the world around. I'm the exception, because all the others here, they don't think. They don't talk and most of them do not even move. Here follows the second excerpt from "The Iron Meditation". This is taken from the first draft of the English version of the novel, up to now only released in Norwegian. The Norwegian book can be bought for example here, here or here. After momentary blindness, a narrow passage appears to me, like a tunnel or a cave. But even if it's narrow, it looks like it has even walls, floor and ceiling. So my legs move rapidly to meet it. After a few steps the floor starts sloping downwards and so does the ceiling, even more than the floor leading to the passage narrowing further and forcing me to my knees, to crawl. No light is guiding me from up front and my body blocks the light behind me. I'm wrapped up in darkness, I feel the cold from all around me, and my body is shaking lightly. I want to get out, yet I don't want to turn back. What would the crows say? And how would I exit? I shudder, and my elbow painfully rubs against the wall upon the small movements of my body. See, even a small movement is enough. A stalactite is overkill. It's enough to get distracted at the wrong time and I'll kill myself by being uncareful. something else than my office prison, to be a place where actions matter and there is a choice of action. Returning to the office and what do I get? To be locked up there for months more before seeing anything else than its walls, the food they bring me and what technology simulates? This line of reasoning seems to give birth to yet another thought, slightly comforting but tainted by my disbelief: The artist who created this park, whose name I know to be Ugnis, why would he make a dangerous park? (I know I can think up numerous answers if I take my time). And what use do crows have of danger? (Abstract. But I won't take my time to break down this question). I detect a chill wanting to be born, but I stop it in time only to be answered by a drumbeat that's not too friendly. But I find myself crawling again, investigating the floor in front of me, trying to find out if there's anything sharp coming out from it. It's pitch dark and any time now I will injure myself. Well, as long as I'm careful, it won't be too bad. I investigate the walls as I move slowly forwards. And suddenly it all tilts forward and I'm pushed on. I lose my grip and I find myself sliding down the iron slope escaping the cold, falling head first. Picking up speed, and movement fills it all. The sinking feeling inside, like my organs going sore all at once. Darkness surrounds me. They had to kill me in the end! I'm gaining speed and I slide faster and faster. I close my eyes but it doesn't take away anything from my fear, so I open them. A bulk hits my right hand, slides along my arm, glides along my torso, scratching me up a little. it slows down. The slide flattens out a little, but it's still wet and I have a taste of iron in my mouth. Then there's a little bit of light, a warm, organic light, with tints of orange, like the light of fire. There is water around me, and it is reddish brown, or is it only reflection? Then... I find myself lying still and I am still alive. I rise with my back bent to make room for my head. The ceiling is still a bit low, but I can move forwards with my body almost erect. The water deepens and smells the same as the taste in my mouth and the images of my mind. Like blood. I wade on to reach a giant hall where there is plenty of room beneath the ceiling. And now it's not too cold anymore. My sci-fi novel, "The Iron Meditation", deals with themes such as the nature of guilt, marginalization, terrorism, speciesism (that is the discrimination of animals based on their species) and anthropocracy (the view of humans as rulers of the world, basically one of today's ruling ideologies). My novel is only published in Norwegian (e-book) and can be bought for example here, here or here. Here, I will publish my first English draft of chapter 5, having titled the same as the novel itself: "The Iron Meditation". There will be 5 (or 6) excerpts. This is the first, called "Blood loses shine". Up till this point, the main character has been held imprisoned by crows, not knowing for what. Finally he is given some variation from his prison room, being taken to the Iron Park. The silver grey surroundings sparkle as I stand within them. Spheres of sharp light hover in the air as the silver grey iron surfaces reflect them back. Surface is upon surface and the walls are curved and broken by all kinds of formations extending out from them. They are like stalactites and stalagmites. Others are like bubbles. Small pyramids rise out of the floor here and there. Other places I find sharp spikes. The sound of a muted drumbeat reach me from somewhere. The sound bounces between the walls, and in front of me the iron park continues as far as I can see. Then another drumbeat reaches my mind. I sit down involuntarily and bend over the metal floor. I lay my cheek against it and feel the stone cold against my skin. I sigh while bouncing chills ride down my spine. Then I undress my torso. I throw away the black cloth I've been wearing and place as much as possible of my body against the metal surfarce. The floor is smooth and beautiful. "Wow!" I exclaim in excitement. I can't remember having felt a cold like this ever. I rub my face toward the floor, like were I a cat. "M" I say. If someone was watching me, I could tell them I'm only a human animal who hasn't experienced much the last year. The crows already know. They know it all. So away with these thoughts. I roll around and I feel the sensations toward my skin. I can see the goosebumps on it. Small ones. Another drumbeat comes from deeper within the iron park. It echoes, and residual sound remains. In the room, and within my head. How big can this park be? What more can I find here? I turn around while still lying on the floor. Now it doesn't feel as cold anymore because of my body that's been on it for I don't know hoe long. I'm done with the floor and rise from it, sharpening my concentration. If I start walking, I must remember that the floor's not even. What if my foot is protruded by an iron spark, a needle, or bruises against unpolished metal? I imagine myself bleeding from protruded feet, how my blood will sparkle dimly and how it will gradually turn cold, congeal and lose its shine. I take a few steps, careful not to cause any situation that will make me shed blood. I move my right foot carefully through a passage between two tall iron cones. At first with my foot pointing forwards until I turn it so that I will have a better grip while I let the other foot follow. The drumbeat sounds again as my hand touches a strange iron formation that reminds me of a miniature pine tree. A non-organic pine tree, in any case, in sparkling grey, almost white. When I hold my hand over the tree, my hand takes on its reflection of pure iron. It fades as I move my hand until my entire body turns sparkly from the reflection from a big, blank surface. I imagine it absorbed by my pale, weak body. But I will walk it off as soon as I take a few steps. Then it will return from somewhere else and disappear again. I walk past more iron cones, orbs, spheres, stars and cylinders, and as I reach the brightest place, another drumbeat reaches me.